Agromyza ferruginosa van de Wulp, 1871; Spencer, 1990. Host specialization in the world Agromyzidae (Diptera) : 198, 199, 200 (figs 744-5). 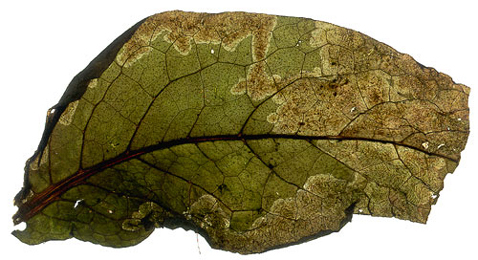 Leaf-mine: A large blotch mine, several larvae feeding together (Spencer, 1972b: 31). A dozen eggs are deposited in a semicircle at the leaf underside. After hatching the larvae eat themselves a communual corridor. After the first moult they begin the making of a very large, dark brown communal blotch, with conspicuous secondary feeding lines (Bladmineerders van Europa). Time of year - mines: September. Distribution in Great Britain and Ireland: Widespread including Surrey (Charterhouse), Cambridge (Chippenham Fen), Huntingdonshire (Woodwalton Fen) (Spencer, 1972b: 31), Cambridgeshire, North Hampshire, West Kent and West Suffolk (NBN Atlas). Distribution elsewhere: Widespread in continental Europe including Germany (Mines in BMNH), The Netherlands, Luxembourg (Bladmineerders van Europa), Belgium (Scheirs, de Bruyn and von Tschirnhaus, 1996), Czech Republic, French mainland, Poland and Slovakia (Martinez in Fauna Europaea).